Thanks so very much for your concern about my whereabouts and Rhonda and Peggy's poetry in the last post made me smile. I had a great, great Easter then came back to the reality of something from the past I have to face which is not worth talking about because we all have bad times in our lives. It's just kept me a little preoccupied over the last few days and will do so for a little while longer. But you are right, I should get on with it and post something. That's what bloggers do right? It just might take me a few days to get the dents out of my humor chip is all. Care to help? Apart from reading a self help book, I've been thinking about all the accidental heroes I have come across in the past few weeks and how inspiring each of them have been to me in their own ways. 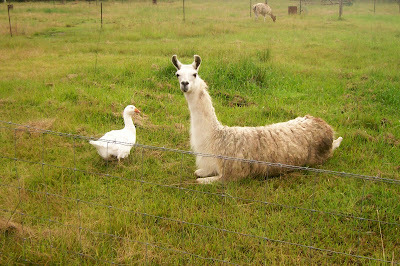 Take a look at Larry Llama and Dorothy Duck in the photo (no, I do not know their real names). Two best friends who live near the cooking school I went to on the Sunshine coast over Easter. Larry saved Dorothy from getting eaten by a fox and they have been inseparable ever since. Larry the accidental hero. I gather that even though we made Duck Vindaloo in the cooking class, Larry also protects Dorothy from ending up in the cooking pot too. And no, I couldn't eat any of the duck dish for obvious reasons. Then there are our fellow bloggers, beautiful Paris, who is bravely starting over after many trials which may have made many others keel over and the brave Braja who has survived an horrific accident and come out the other side seeing the beauty in her life and thankful for all she has. Heroes. Travelling to the airport I heard on the radio about an American guy called Doug White who was on a small plane travelling in Florida with his family. After a smooth take off and ascent the pilot threw his head back, made a guttural sound and died. Just like that. White, who had his pilot's licence but had not flown for 18 years or so and never a plane of that size, had to land the plane safely with the help of traffic control. An accidental hero. Can you imagine being able to do that when there was no choice but to give it a go? Then of course there is the story of 47 year old Susan Boyle the Scottish singing sensation who wowed audiences on a British talent show with her incredible voice and a perfect song, I dream the dream. She faced the scoff and derision of others to become her own hero and an accidental one for many others across the world. If you haven't seen the video of her audition then watch it. It's inspirational! Tell me about any accidental heroes in your life. Who inspires you. Maybe you are your own hero. I will be posting about my trip away (which was so, so good thanks to my gorgeous Jordan) over the coming week and catching up on your blogs!! Promise! Ooooh you made us worry about you Lilly, so glad to know you are okay! I'm just so happy to see you in my blogroll. I almost cried! Welcome back love! there are a lot of spirit filled souls out here in blog land... keep my world smiling and you are one of them... so don't you disappear like that again missy! Sorry to hear about the ****. I was just going to visit and say, "Where are you?" and as I scrolled down on my bloglist there you were. Odd. I'm glad to see you back and I hope things get better soon. I remembered you were away when I thought of you! I found this blurb on wikipedia about our former Prime Minister and thought the cardiologist might've been an accidental hero, or else Jean Chretien was just lucky and fixed his heart just before a possible attack. Hi Lilly :) You are right, we all have ****** that happens in our lives. You are also right that when we least expect it, we often find those accidental heros, people that lift us up and are there for us in just the moment we need them. I hope you are doing better soon. Somehow I don't believe a beautiful spirit like yours can be held down for too long. My hero was not accidental, she is my daughter. Although she does things that she does not realize that gets me through life. She is my angel on my shoulders. Hang in there, glad to see you back blogging. Missed you. Well hello there, stranger! Thought you were taking a long Easter vacation! Sorry I cannot cheer you up in my latest post but maybe the next one...! You should go over to Marinka's! That will make you laugh!!! I have a lot of people in my life that inspire me everyday. You lily are one of them! Thanks you for that! Girl... I was wondering where you were!!! My heroes.. always Mama, and lately, Braja, and my little boy Johnny. Sorry you've had a hard time lately. Totally understand about losing the humor when stuff happens. Hope you find something that will make you laugh. Welcome 'home' Lilly. I loved the little story on Larry the llama and Dorothy the duck. I hope you get over whatever is ailing you very soon. I just heard on TV this morning that Susan Boyle has received over 20 million hits to her website. WOW! She is a hero to many right now and nice to know this amount of people just love real people like her. I am waiting for the day when the whole cult of celebrity worship just dies and never rears it ugly huge head again. Go the real people of this world, we do matter, too! You did come back. We missed you. Put your Supergirl cape on and fly right through the crap Lilly! I loved watching Susan Boyle too as it reminds us that people's true talents shines through regardless. Her life will be changed forever I think. @ Dar - thanks sweetie, you are a great blogging buddy to many!! @ Sandi - thanks for emailing me to check if I was ok given my absence. Appreciate you. @ SHST - Thanks, all will be fine. @ Christine - oh wow you have to believe in fate really when you read a story like that hey? @ The Chick Geek - oh thats a lovely comment, its all about having an uncrushable spirit you are right and I am trying, I am. @ Dwayne - yep I think my daughter is mine too. And we are blessed arent we? Thanks for dropping by! @ Roshni, ok I look forward to your next post though I will come over and check the ones I have missed!! @ Peggy - well youa re another one to go on the hero list Miss Peggy too. Be over to check out your blog soon! @ Saundra - Loved hearing about your heroes! @ Joanna - oh we all go through it but thought I better say why I have been away for a while. Have had lots of fun too. @ Rowe - oh you are so right. I loved this line. Go the real people of this world, we do matter, too! @ Sarah - go the cape on and prepared to fly!!! You make me smile girl, thanks! Glad to see you back! I read about the pilot and have watched the tape of Susan Boyle several times. It never ceases to amaze me! My heroes are my children. They always bring me up when I am down and are there for me. Thought of you yesterday when I was at the airport picking up my mom who is here for a week. Hey - bomb scare there yesterday - real wash out though. Someone was paying their fee at the parking thingy, and they left a piece of their luggage. When I went to pay my $2, the xray machine was coming, there was a police presence... it got a bit busy! But, it all came to nothing I presume. I made a new one of Smart cars tonight. :) I should post more often! Hope you are OK, thinking of you. My sixth sense told me you were lying low and I thought I could lure you out of that hiding place with a little crazy humour. So pleased to have you back blogging Lilly. You know I have come to realise there is nothing more therapeutic than putting pen to paper or fingers to keys. Caroline over at The Zen in You (another accidental hero) agrees with this theory when she posted on 14 April "Your Wise Words". I must also tell you the comment you wrote on Paris's blog was so heartfelt and full of wisdom....I think of YOU as an "accidental hero". OK enough of the serious stuff...here is a duck joke! Big hugs and love enclosed. That Peggy is something else. Take Care and pray, seriously. This will pass and you will be back to your very funny self. Besides, we all want to hear about the non cook doing fancy cooking classes. By the way have you heard if Matt is coming back to blogging? Wanted to come over and thank you for joining my blog. If you read my latest post (Mom, I'm in Scotland,parts 1 & 2), you have already heard about one of my accidental heroes! Going to take a while to play catch up here, but am glad I found you and will be anxiously awaiting the outcome of your adventure. Hi Lilly. I understand about you feeling a little under the weather. I have just come back from a wonderful holiday which was dampened by my learning of the death of a special cousin. PS: Congrats on reaching page rank 4 - you rock! I guess, my accidental hero would be my oldest son. Before I had him I was very wild, selfsh, and sometimes self destructive. You know-- dating really good looking assholes, drinking way too much, choosing not so good friends, and not looking at my future at all. When he was born my entire outlook on life and even myself changed. Lilly! I kept assuming you were still away, but two days ago as you dropped further down my blogroll, I too started to wonder :) So glad you are back. Can I nominate all the volunteers who helped save 90 percent of our community from the grips of the flood? Not a single one signed on to be a hero by themselves, but they gave so selflessly, continuously, that collectively they all became heroes for the big work that they did. We came together and triumphed... accidental heroes? Love to you Lilly! Welcome back, I missed you! Glad to see you posting again. I completly understand to need to step back once in a while. Just went through a similare thing myself. Glad you are back, missed your unique style and delivery! I've told you about my son and his engagement ... wedding is on track for October 10th! He is definitely my accidental hero ~ and an inspiration to so many others. Susan Boyle right now! She's so inspiring! Susan was amazing with her singing. The guy that landed the plane was awesome. The animals sticking up for each-other and bonding almost makes me cry. Who is my hero ? Anyone truly loving, in that moment where they let their heart be wholly seen. I'm so relieved and happy you're back, Lilly. I kept looking at my sidebar to see if you'd posted something new. Please take a rest. I'll wait for your next post. My hero? My mother in law for one, who had so many terrible health issues but kept smiling and thinking about others even after her mastectomy, leg amputation and finally throat cancer. She never complained. She gave her love to everybody. Comforting thoughts to you Lilly. As some others here point out, we all can have personal hero. Most of the time that hero is only know to ourselves. Being a friend can make you a hero. It's good to recognize good people and I like to believe most of us are willing to give the hero type effort if we are called upon. My mother was a hero to our family and the neighborhood. Knew where you were, but was concerned that it was taking you extra time to get back on the web and figured it might be one of those old dark shadows that tend to follow us around and pounce when we least expect it. I'm always here for you in whatever way I can be, have been in those dark places as you know. love you, i'm here for you. I was so worried, but I'm thrilled to know you're okay. Accidental Hero? That would be a few people many right here in the blogosphere. Thanks everyone for your comments and friendship too. I just needed a kick in the right direction to get back in the seat! I will come by and leave you a comment on your blogs! I am so glad you are back and I hope things get better and better for you. May HE who is able to comfort the hurts be with you every step of the way. Susan Boyle is fabulous, Ive watched her video a number of times. Glad to have you back Lilly - you're an inspiration to us all! Hi Lily ~ Good to see you posting. My accidental hero is Liz my ex-wife, who took care of me over last year and the year before, when my health went on the blink a bit. My father was a hero in the way he supported my mother and my mother was a hero in the way she coped alone, after a long marriage to a husband to took so much care of her. ya - i dont think i could eat duck after that either. my accidental hero would be my old BF... he was my first "serious" relationship after the divorce. he made me feel whole again. he made me realize that i deserved to be treated with love and respect and "handled with care". He made me feel "normal", and not in spite of my quirks, but because of them, actually. a part of my heart will always anf forever love him. Glad you are back, dear Lilly, and hugs to you. Susan Boyle is my hero right now. I cant stop thinking about Susan Boyle, & the wonderful reality of her, & the way she has made many people take a second look at themselves, & their attitudes to others. Love the story of the Llama & the duck. All of us six kids were accidents so I guess that makes mom and dad heroes. They did a good job of raising us all, so I have to tell them thanks once in a while. Thanks for your comments everyone. I will be around to visit your blogs today! I wondered where you'd gone. Wow, you've gotta love the blogging community. So many heartfelt comments left here. I really hope you get through this time as peacefully as possible and find your sense of humour soon (it will help with whatever you're challenged with at the moment). My accidental heroes are my family and close friends who stepped up to carry me, cry with me, give me hugs, feed me Vegemite on toast, listen to me and generally keep me going during a very sad and painful divorce. You have lots of readers who really do care about you and your well-being. It's very heart-warming, isn't it? In time, things will be alright again. If you must take some time off to sort things out, we'll definitely understand. Just know that we'll always be here for you. I have to say that my husband and daughter are my heroes. I have seen Susan Bole's sensational performance. It got me pretty choked up. I guess we all have 'stuff' that sometimes we need to go through, quietly on our own, sometimes just to make sense of it, other times because it seems to be the only way we can. One of my accidental heroes over this last year in particular has been nature. Sunshine on back, or a rainbow after rain. So glad you're back! I hope whatever's going on passes quickly (or at least gives you some good material for a book someday!) Your fans have missed you. I;m blessed to have people in my life who truly show me love and support. My family are my personal heroes. I know that each one of us have their own personal heroes that save us one way or another. I wish you peace of mind and strength. you know, I think both you and Paris are great sources of inspiration. "It just might take me a few days to get the dents out of my humor chip is all. Care to help?" --I understand perfectly. Tell you what, when I get my dents out, I'll tell you how. i think mine are gogin to take a fair bit of time though. I hope your particular problems don't bring you down but get to remain safely put away so oyu can go on with life, unhindered, and giving out all the joy and laughter you so freely share with us here. Whoa...Lilly. I feel so unworthy of your blog post. I was just sharing with a dear friend on how it is hard for me often to see how I am an inspiration to you and others, for you have not really known me that long. And my family...well, they have known me my whole life and still have yet to see what you and others see in me. It is heartbreaking, but I am so humbled by you and others who love me and care for me as you do. @ Paris, maybe because we see the spirit of a person through their writing and many of us who blog express ourseves far better in the written form than in any other is why this is. We may really see you, your spirit, and we are not influenced by anything else. The blogging community is a wonderful one! I am glad you are back and had a good time. Thanks! I have never seen such a horse. It is really nice. I like it.